Other people are interested in how to make their bubble more tangible, more real, an actual community. Continual protests large and small in major cities are translating this interest into mass spectacle. But after the photos are tagged on Facebook and the crowds disperse, is there any lasting effect? Has community occurred? 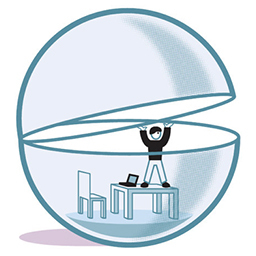 can be seen as a model for reframing virtual engagement (the Facebook bubble) into physical community (actual people, albeit still surrounded by likeminded peers).